It’s time for one of my favorite kinds of posts – another room reveal! In fact, this is the one bedroom in our home I haven’t shown at all yet. It’s the room we keep for our son, so if you’ve ever looked for a young man’s bedroom decor ideas, this one’s for you. There’s also a complete source list with links at the end of the post. 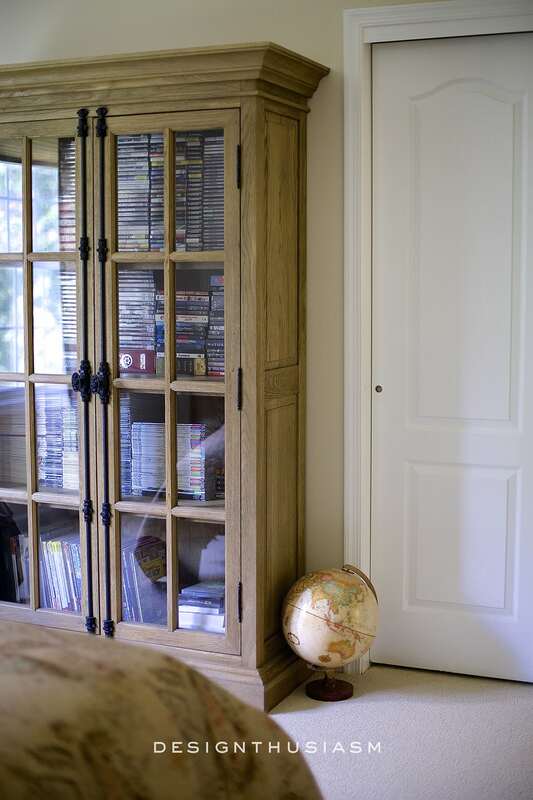 My challenge for this room was to ensure it was masculine enough to work for my son, but since he has his own apartment and doesn’t actually live here, I also wanted the room to fit the style of the rest of our home. That meant traditional fabrics and pattern mixes, accessorized with antique pieces and capped off with a little edgy touch. 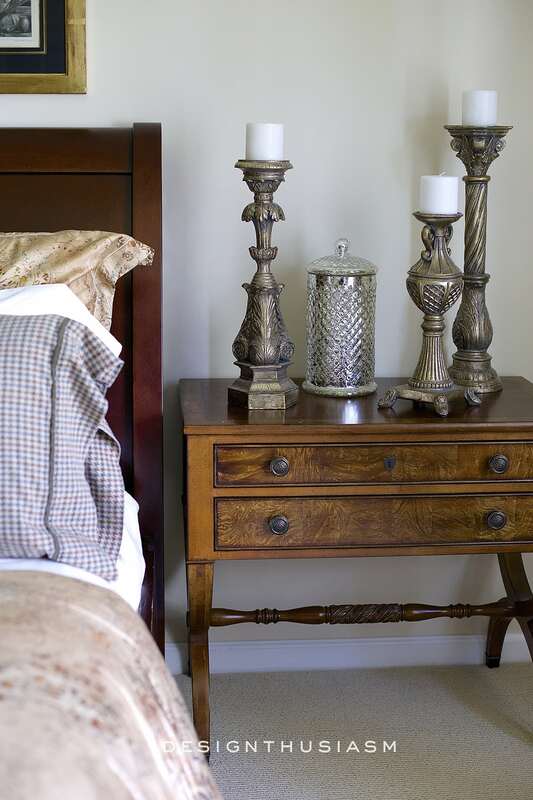 The primary furniture pieces are dark woods, from the cherry sleigh bed to the burled wood nightstands. I’ll probably add lamps some time soon, but for now the tall bronzy candlesticks make a nice bedside impact. 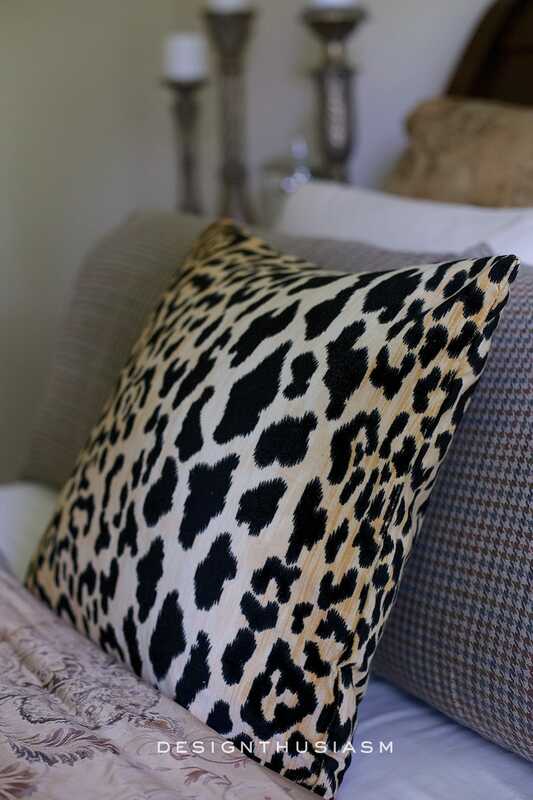 I love to use menswear fabrics in masculine rooms, but to keep if from getting stuffy and to add a hint of a younger edge, I added the cheetah print pillow which becomes a key focal point. An antique chair is tucked in the corner, which was completely rescued from the vintage mess it was when I found it. You can read my post about that transformation. 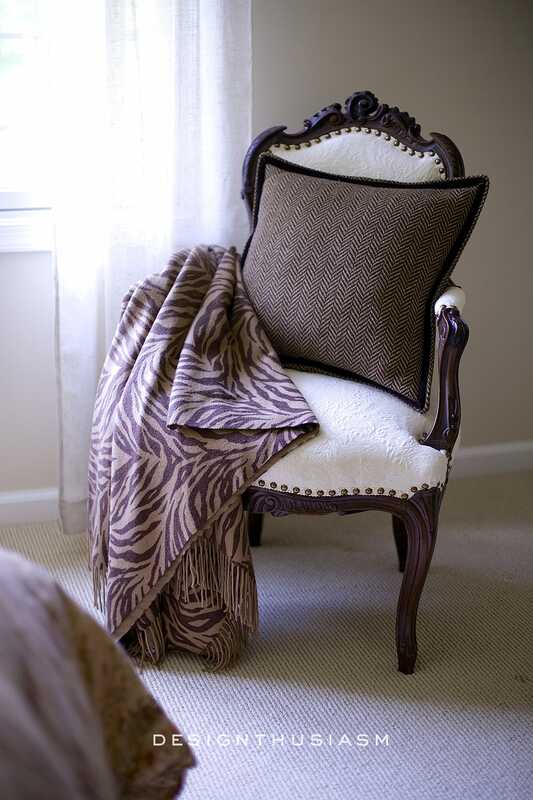 The French lines of the chair are balanced by the tweed pillow and animal print throw. On an empty wall I put a dimensional arrangement, something I like to do for added interest. The chippy shelf provides display space, while taking up very little room. 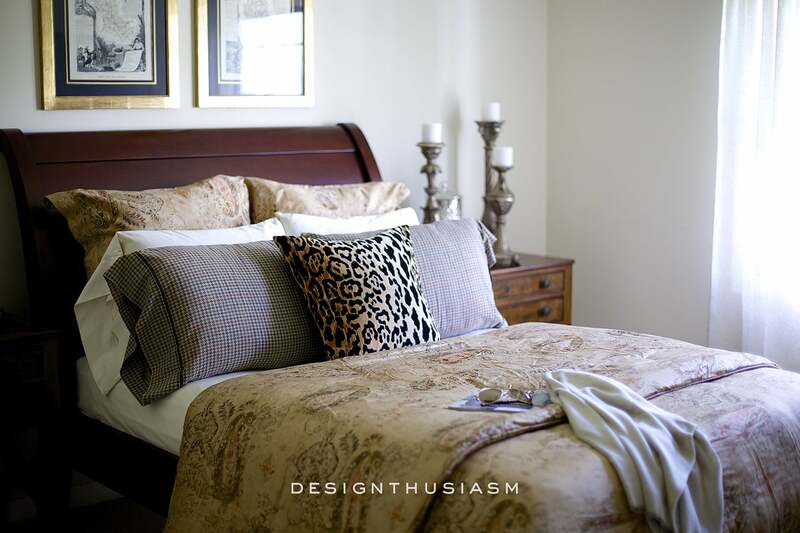 The centerpiece print is a camel paisley in a soft sateen, which plays well off the solid cream sheets and guncheck pillow cases. I used beige linen drapery panels for a subtle window covering. 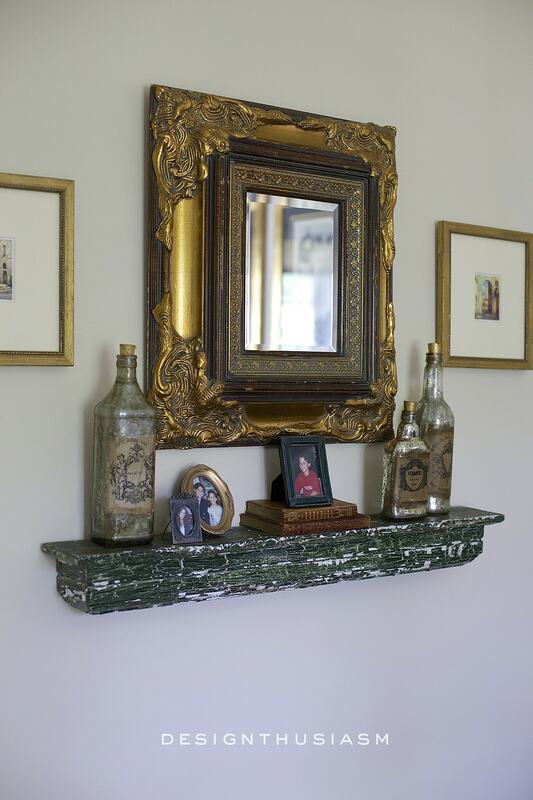 A small TV is mounted on the wall, certainly not hidden but as streamlined as possible. 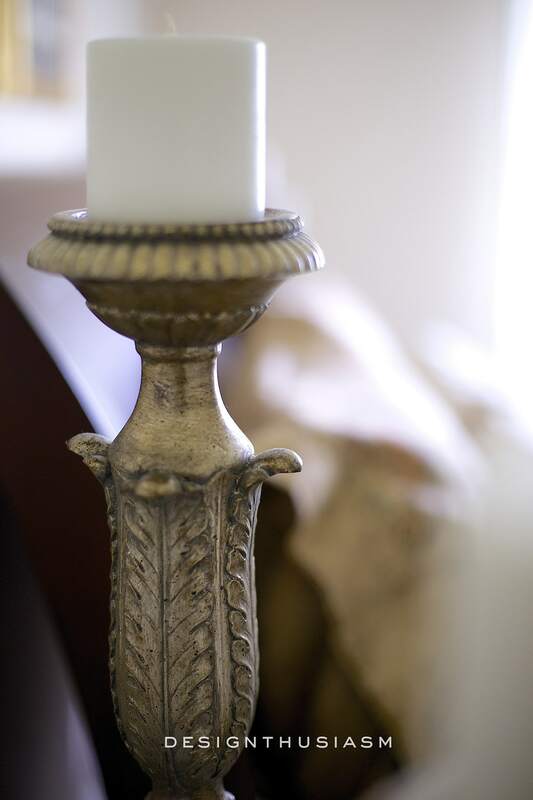 The warm toned bronze of the painted candlesticks works well with this room – I have the same ones in silver that I keep in our den. They’ve all wound up in my table settings at one time or another. 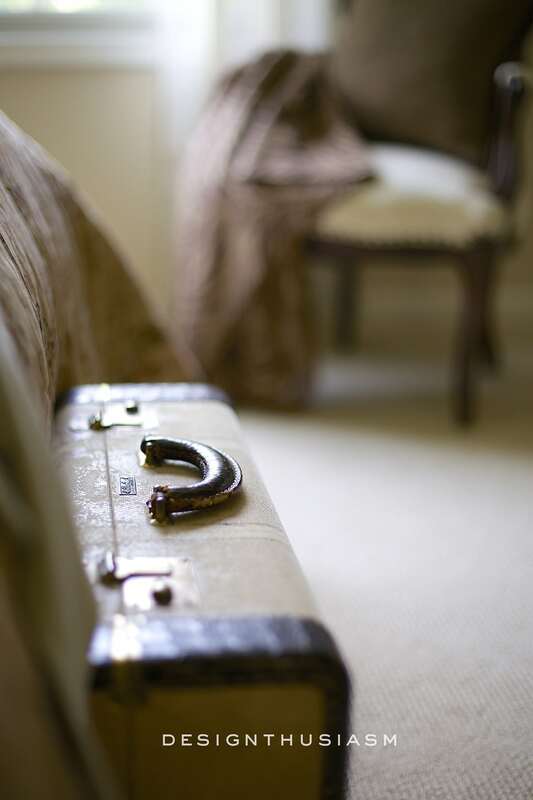 Below you can see the vintage suitcase that sits at the foot of the bed. I love the way it works with this space. The thing that held up the completion of this room was, oddly enough, the artwork over the bed. I was looking around for a while and finally found these wonderful vintage maps of parts of France. The mix of these bold pieces with the cheetah pillow is what really gives this room it’s essential identity. If you’d like to look at some of our other bedrooms, you can find the guest room here and peek at my daughter’s room here. For more young man’s bedroom decor ideas, you might also like to see my son’s bedroom in his own apartment. 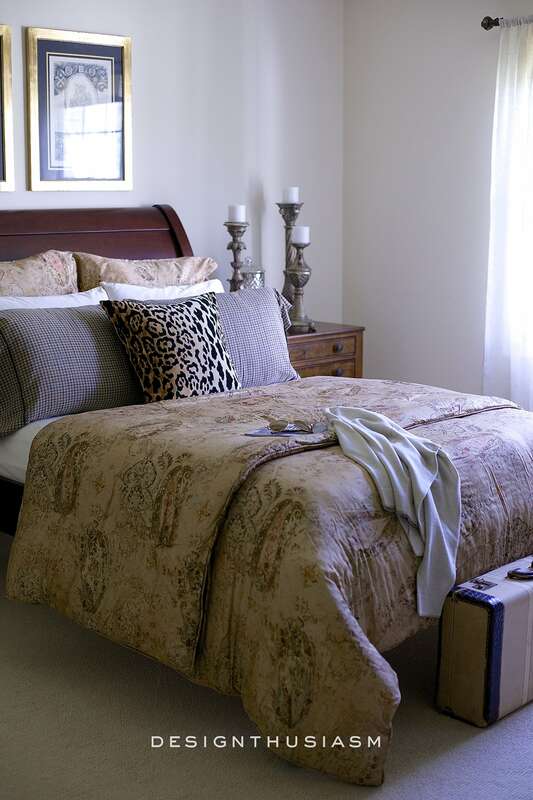 Stay tuned for some upcoming tweaks to our master bedroom, as well! You are so good!! I wish I lived near you so you could come to my home and I would give you carte Blanche to do whatever you wanted. The room is beautiful, Lory! The room is fabulous! 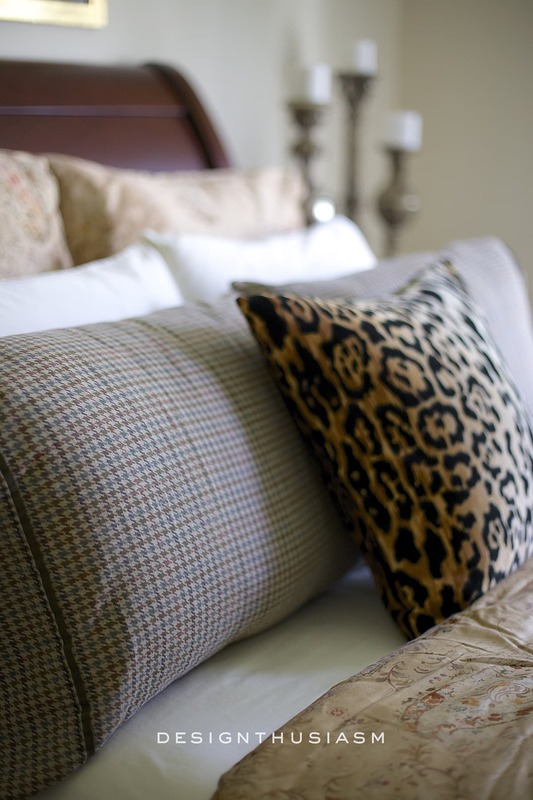 Love the pattern mix…I prefer a cheetah print to a leopard print…go figure… Do you use it as a guest room? Thanks, Donna! But wait – I didn’t know there was a difference… lol! I use the terms interchangeably. As a former print designer, I know we used source material pretty loosely. So what is the actual difference? In any case, that pillow is actually there as a place holder for the real pillow I intend to get for the room (but didn’t have time and this was one of two that are actually in my living room). Shhhhh….. 😉 The real one won’t be either cheetah or leopard, but it is a skin print. Stay tuned! Lori you did a beautiful job! The room looks gorgeous! I can tell that you put a lot of thought into it. All the special touches look wonderful! I hope that you have a great day!!! Thank you, Shannon! You always leave such beautiful comments… 🙂 Wishing you a great day too!! Lory, love your son’s/guest room! You did such a nice job of decorating! Love your style! I am new to your posts and am really enjoying each one! Have a great day! Thank you so much, Mary-Ann! What a nice thing to hear… 🙂 I’m so glad you’re enjoying and thanks for taking the time to say hello!! Perfect retreat for your son….for anyone. 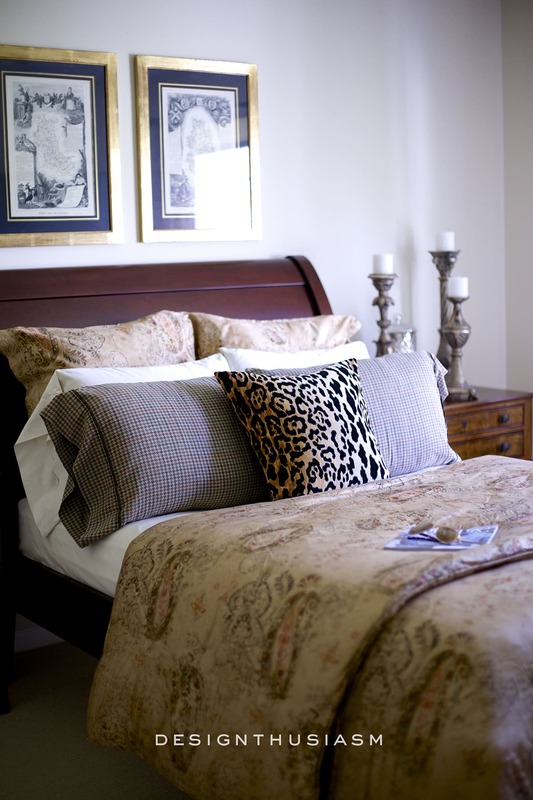 I love masculine rooms…guess that’s why we ended up with a late 1800’s “golf room” and a “fox hunt room”, lol! I’ve always been drawn to that RL English country look. Of course, I’ve always been drawn to French country, romantic rooms, nautical, Civil War, and some British Colonial as well, lol! Unfortunately, they don’t all look good together in one place. Too bad we can’t afford several houses…..did I just say that, when it’s taking us like forever trying to decorate the one we have! Oh, well, one can dream. Your home is stunning. Incase you didn’t catch my remark on your home video tour, I wanted to let you know that hearing you live was wonderful because it just showed you are as real and sweet as I envisioned you to be. Loved the tour, and getting to see more of your home was such a treat. Thanks so much, Bobbi! I was at a blogging convention last week, so trying to catch up on the comments now. Will have to look for that one, but thank you so much!! I was quite nervous to do the video… lol. 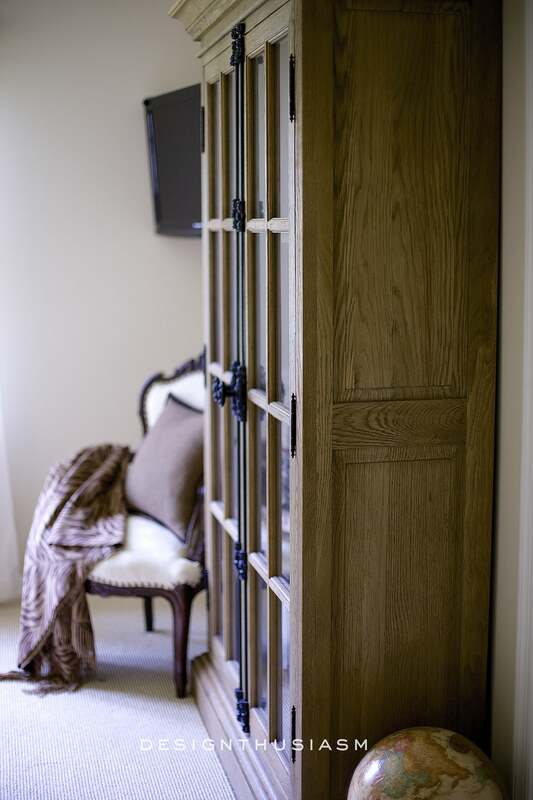 And yes, I too love English country and try to mix it in with bits and pieces in my otherwise French home… 😉 But, then again, I love all the other styles you mentioned, as well!! Thanks so much for taking the time to leave such thoughtful comments! !